Since 1982, the Duffour family have developed high quality wines in the most beautiful territories of Gascony which brings the wines a typical and expressive character. 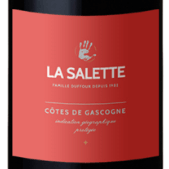 La Salette Rouge offers subtle fresh fruit aromas and spices, to finish on soft tannins. Consumption: Perfectly accompanied by all your grilled meats and roasted poultry. The vineyard lies implanted on nature limestone soils, surrounded by limestone quarries, enabling it to produce rich wines, concentrated, very marks by a 'terroir' undeniable effect and a distinctive character out of the ordinary, which make them unique. With the Oceanic climate and the proximity of the Pyrenees, it’s very partial to have hot summers accompanied by fresh nights and this is the best way to support the aromatic quality of our grapes.